Welcome to the beginning of our fall color reports for 2013! 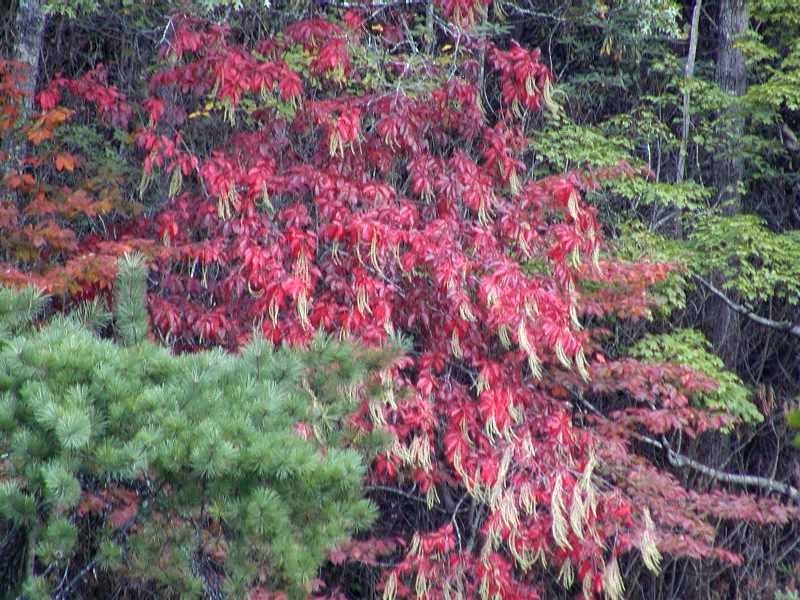 Each Tuesday for the next six weeks, we’ll be sharing updates on fall foliage in the North Carolina mountains, namely, what trees are changing and where you can see fall color each week. Sometimes the fall color season stretches to the second week of November, and if it does this year, we’ll do a bonus Week 7. So here we are at Week 1: Burning bushes, Virginia Creeper, goldenrod and purple asters provide most of the early fall color at all elevations. And the bright red berries on mountain ash trees are showing up at elevations around 5,000 feet along the Blue Ridge Parkway, making it the place to go in search of fall color during the first week of October. Here’s a beautiful photo taken by Sue Tarkenton near Milepost 316 (Linville Falls area). 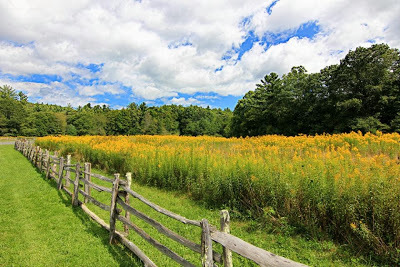 Shared on Facebook by Blue Ridge Parkway Daily, her photo shows a “field of gold” — goldenrod, that is. As you can see, almost all of the trees are still a lush green, making this field really stand out. Mt. 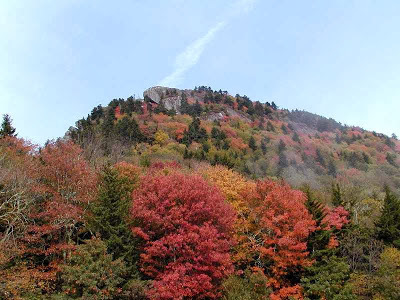 Mitchell State Park: The Black Mountains contain six of the ten tallest peaks in the eastern United States, led by Mt. Mitchell at 6,694 feet above sea level. Mt. Mitchell State Park has hikes for all skill levels, and even the most leisurely of walkers can enjoy the top via a short stroll up to the observation deck. From here, you have a panoramic view of the North Carolina mountains and you’ll be able to spot any color change on the ridges below. Don’t expect much color this early, but do take advantage of the pleasant daytime temperatures and get out for a walk or hike around Mt. Mitchell, because in a few weeks, it might be cold enough to snow there! Two good hikes in the fall at Mt. Mitchell State Park are the Deep Gap Trail (which goes to the second highest peak in the eastern United States, Mt. Craig) and the Old Mitchell Trail (a 4-mile roundtrip between the Ranger Station and the top). Ask us for a Mt. Mitchell trail map when you stay at the Inn on Mill Creek Bed & Breakfast. The park is roughly an hour away, with a beautiful two-hour driving loop from the Inn to Mt. Mitchell via Hwy 221 and the Blue Ridge Parkway, then south to Asheville, and back to the Inn. We do recommend going to Grandfather Mountain in the middle of the week during leaf season as going on weekends can mean waiting in line in your car just to get in to the park. However, if you do happen to be there on a Saturday, we recommend starting your trip at Linville Falls nearby and then heading to Grandfather later in the day to avoid the afternoon crowds. The Grandfather Mountain ticket gate is open until 6pm on weekends and 5:30pm on weekdays in early October. The cost is $18/adult. watch the green leaves around them catch up and join the color show. just yet. Pisgah National Forest at our elevation remains 90% green this first day of October. There will, of course, be much more to report this season, so please check back next Tuesday for more photos and tips! Special note as of October 1, 2013: Due to the federal government shutdown effective October 1, 2013, the Blue Ridge Parkway Visitors Centers and National Park Service-operated attractions and campgrounds along the Parkway are closed. However, the Blue Ridge Parkway road remains OPEN, as do state parks and attractions along the Parkway, including Mt. Mitchell State Park and Grandfather Mountain.